The post Getting a Puppy to Pass the Canine Good Citizen Test by Jill Breitner appeared first on Dogster. Copying over entire articles infringes on copyright laws. You may not be aware of it, but all of these articles were assigned, contracted and paid for, so they aren’t considered public domain. However, we appreciate that you like the article and would love it if you continued sharing just the first paragraph of an article, then linking out to the rest of the piece on Dogster.com. Since puppies are capable of learning at 8 weeks of age, teaching them basic skills (like sit, stay, come and down, and appropriate social and safe behavior in public) through positive reward training is the best way to lay a foundation of trust and engagement, creating the bond we’ve always craved with our doggie partners. 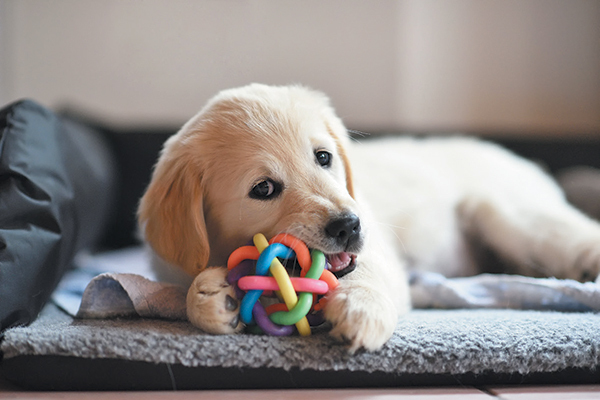 Being a proactive puppy guardian means that we are setting our puppies up to win, and what better way to do that than by starting early, while they’re ripe and ready to learn, with the American Kennel Club’s Canine Good Citizen program. You can easily train a puppy to pass the Canine Good Citizen test! Photography ©Photology1971 | Getty Images. Mentally stimulating a puppy by teaching these basic skills only takes about 20 minutes a day. Training sessions for pups under 4 months of age should only be about 3 to 5 minutes per session, about 4 to 6 times a day, using reward-based training. This alone will tire a puppy out more than physical exercise. Since puppies are looking to engage, why not mentally engage them with short training sessions along with physical exercise? Don’t think of the CGC program as formal training, rather that we are positively molding our puppies to be safe in our fast-paced, human-dominated world. By doing so we are mitigating unwanted behaviors, making it an honor and joy to share our lives with our puppies. Once your puppy has learned these skills, he can take the 10-step CGC test to attain a certificate. This certificate is proof to show your homeowners’ association, condo board, rental management company, insurance company and more that your dog is a well-mannered one. Thumbnail: Photography ©hnijjar007 | Getty Images. Award-winning writer Jill Breitner has been training dogs since 1978. Her passion lies in teaching people about dog body language. Jill created the Dog Decoder app (available in Google Play and iTunes) as a way to enhance the human-dog bond by understanding them better. You’ll find her at play near the ocean. Follow her at dogdecoder.com, facebook.com/dogdecoder and on Twitter at @shewhispers.